Bronze vaults, beautiful and highly-durable, provide truly superior protection. Our bronze cremation vaults come in a variety of styles and finishes, feature precise engineering, and hand-crafted details. A beautiful, warmly colored metal, copper has long been prized by artisans and sculptors. 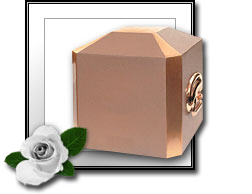 A copper vault provides excellent durability with superior long-lasting protection for a loved one's cremation urn. Lightweight, yet extremely strong, each of our fiberglass cremation vaults is made from strength engineered glass fiber composites with 3x the strength of steel. Fiberglass vaults are not only strong, but affordable. A lined cremation vault is intended for the highest possible level of protection for your loved one's cremation urn. With concrete cores with ABS plastic, copper and bronze liners, these vaults are among the finest quality available.